Every day we field calls from sellers checking on what they can do to their home to increase the homeâ€™s value prior to sale.Â These questions center around improvements such as solar (we donâ€™t recommend) painting (yes!) flooring and so on.Â Yet one of the biggest forfeitures of value is â€œto whomâ€ and â€œhowâ€ we sell. To whom we sell.Â End users always pay the most for any product â€“ whether a home or a car.Â It has the highest value to them as they are the ones with the need.Â Selling to an investor typically brings a lower value because they are not the end user and there is no emotional connection to the home.Â Owner occupants pay more â€“ but even amongst those buyers the value can vary widely depending on how motivated they are and how limited their other options are (i.e. if the home serves a particular need such as dual master bedrooms, handicap accessible, a certain school district, etc. )Â In negotiation, the concept â€œhe who needs the deal the most, gives the mostâ€ proves true. How we sell.Â When we sell with no competition value typically drops.Â The very premise behind capitalism is that an open market sets pricing.Â The smaller the pool of buyers exposed to your home, typically the smaller the value.Â In other words, you can artificially hold down demand by limiting exposure to your home.Â By owner sales and direct to owner investor offers fall in this category. Even homes that must only sell to an investor (severe property condition issues or tenants on long term leases) will obtain higher values if they pay attention to â€œhow they sellâ€.Â In short, the way to get top dollar is to expose the property to the most available buyers.Â If an investor is the only option as a buyer, creating competition amongst those investors will typically better protect value.Â What most sellers donâ€™t know is that those investors flooding your mailbox with â€œwe will buy your homeâ€ offers â€“ will also make offers to listed homes that meet their criteria.Â That is good news for sellers wanting an investor offer as a good listing agent can attract multiple investors and make them compete on price and terms for the home.Â Also a listing agent can help the seller understand the real costs behind the â€œyou pay nothingâ€ investor offers.Â Anytime venture capitalists are spending millions funding â€œWe buy homesâ€ companies, you can be assured you are NOT receiving a â€œno costâ€ offer for your benefit.Â Venture capitalists only spend money when they believe there is plenty of money to be made for them.Â Who is paying them?Â The often unsuspecting home owner is paying them in lost equity. …. The net offer does not include the buyer’s agent commission. That resulted in 15K more in the sellerâ€™s pocket before Open Doorâ€™s â€œrepair negotiationâ€ which often results in additional reductions.Â This is not to pick on Open Door (or any of their ilk such as Offer Pad, Iknock, etc.) but rather to point out that sellers will always net more on the open market – if their home is marketed to the most buyers possible.Â If the goal is the most money, shouldnâ€™t this be a last resort and not a first? Active listings are down 14% since March of this year. If youâ€™re a seller â€“ low supply – that sounds like a sellerâ€™s market doesnâ€™t it? Â Â Â Of course, if we compare active listings now to this time last year, we are up 28% in supply. That sounds like a buyerâ€™s market doesnâ€™t it? Â Â Â See how confusing this gets? Price appreciation for the last year came in at a paltry 1.9% (for non-distress sales). By the way, inflation is running around 1.9%. So essentially, houses have not really appreciated in the last year. The seeds of weakness in pricing started with the market shift that began in 3rd quarter of 2013. But as we stated before, there is what is happening and then when the market knows what is happening â€“ which can cause a lag in price changes. Â Â Â Indeed this is the case as the softness in pricing that began a year ago finally showed up in this yearâ€™s 3rd quarter. So thatâ€™s a buyerâ€™s market right? New listings coming to market began the year up 9% over last yearâ€™s new listings. But again, as the market is a moving target, new listings suddenly dried up as the 3rd quarter began, coming in 10% less than the same time in 2013 and 8% less than in 2012. This is notable because in 2012 new listings to market hit the lowest levels since 2000 â€“ a shocking and record breaking event. 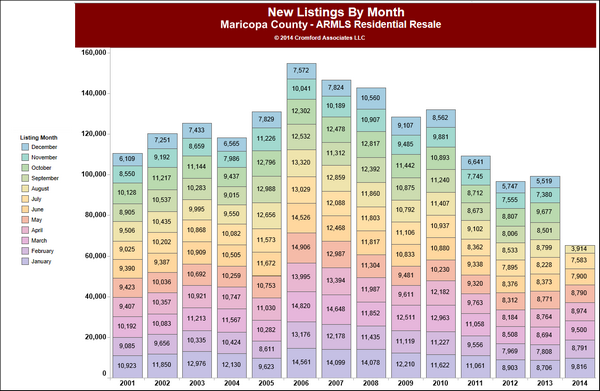 Â Â Â Yet in the 3rd quarter we hit the lowest new listings to market ever for this time period. Â Â Â So thatâ€™s a sellerâ€™s market right? Demand was grabbing all the headlines this year, as buyer demand cooled significantly. The causes were attributed to tougher lending guidelines, interest rates climbing, Millennials (i.e. first time home buyers) not buying, and investors going away. Interest rates seemed like a red herring â€“ as when rates dropped there was no corresponding jump in demand. Millennials are in fact not buying. This has been attributed to â€œseeing their parents lose their homes in the distress marketâ€. Hmmmm, maybe. Millennials seem to be delaying all traditional signposts of adulthood â€“ marriage, children and housing â€“ so it would seem to be a cultural change in commitment, not housing per se. It is certainly causing a boom in rental demand at the moment. Investor demand definitely shifted â€“ going from 33.5% of the single family market purchases in 2012 to only 11.8% in 2014. So, no matter the cause, if buyer demand drops thatâ€™s a buyerâ€™s market right? So letâ€™s try to answer that nagging question. The market is swinging slowly and surely back towards a balanced market primarily due to the weakest arrival of new listings in 14 years.Â Â But, if that is the state of the overall market â€“ it does not preclude the fact that the market is really a series of markets within a market.Â Depending on price and location â€“ some markets are definitely in a sellerâ€™s market and some are most definitely in a buyerâ€™s market.Â How can a consumer know the reality of their market?Â At the risk of sounding self-serving you need the analysis of a competent real estate professional.Â The study and accurate interpretation of supply and demand in the submarkets is the only way to truly understand your marketplace.Â As always we are here to help.Â Our thanks go to the one and only Michael Orr for his incredible Cromford Report statistics. 1. Price appreciation flattens in a flat market. We know this sounds counter-intuitive but bear with us as we explain this. Prices are always a trailing indicator in housing. 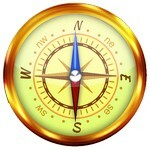 This means that anywhere from 9-18 months after something happens in the market â€“ it is reflected in prices. The market started shifting away from a sellerâ€™s market in June 2013 when buyer demand began withering. Pricing runs on fumes for a while before evaporating. That â€œfumeâ€ stage is a sweet spot for sellers because prices are gently floating up, word is not really out on the street that the shift has occurred, and the big future price appreciation that sellers would miss out on if they sell in a sellerâ€™ s market – is not being missed. In other words, when prices go flat â€“ sellers are selling at a peak. 2. In a balanced market, builders remain conservative, adding only a trickle of new homes. In a strong sellerâ€™s market, builders â€“ just like any other seller â€“ want to cash in on the strong appreciation. This starts adding more and more supply of homes â€“ which as we observed in 2005 â€“ and can create a bubble that â€œpopsâ€ when supply becomes glutted. As we have seen, recovery can be painful and slow after that pop. 3. 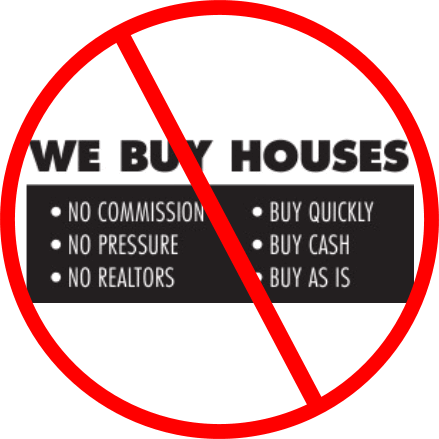 In a strong sellers market, successful sellers become â€œhomelessâ€ when they are unable to find a home to buy. Sellers who are buying locally, enjoy the power a sellerâ€™s market provides them as a seller, but then find themselves stressed and panicked when trying to buy in that same market. This can lead to poor buying decisions and huge concessions to obtain a home. 4. Less problems with low appraisals. An often overlooked problem in a strong sellerâ€™s market is the financing piece. Lenders base all their numbers on the appraised value of a home. In a rising market, prices begin escalating over yesterdayâ€™s pricing. While sellers often get a higher than expected yield at point of contract, they can find themselves giving that money back to the buyer when the appraisal comes in low or risk the transaction cancelling. 5. In a balanced market there are still enough buyers around to still sell without great difficulty. 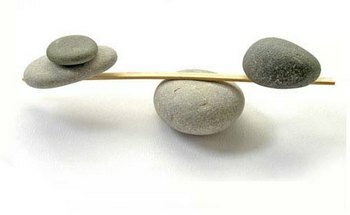 A balanced market means just that -buyers and sellers are in equal supply. So although the â€œfeeding frenzyâ€ may not be present, the buyers are still viewing and buying properly marketed properties in sufficient quantity to make selling a relatively easy and fast process. How long will our market stay balanced? That is the million dollar question. At the moment, we see nothing dramatically pulling the market one way or another . But as Sir Isaac Newton so brilliantly said â€œ I can calculate the motion of heavenly bodies, but not the madness of people.â€ As always, we will do our best to keep you informed on the Valleyâ€™s volatile housing market.